First, the Earth (whether flat or spherical) was considered to be the center of the universe. Then, the Sun was considered to be center of the universe. Eventually, mankind came to realize that the Sun is just one of 200 to 400 billion stars within the Milky Way galaxy, which itself is just one among hundreds of billions of galaxies in the known universe, and there may even be other universes. Astronomers have long believed that many stars would have planets around them, including some Earth-like planets. Carl Sagan wrote and spoke extensively about this in the 1970s and 80s, but we did not have the technology to detect such planets at the time, so the discussions remained theoretical. There were no datapoints by which to estimate what percentage of stars had what number of planets, of which what fraction were Earth-like. The first confirmed extrasolar planet was discovered in 1995. Since then, continually improving technology has yielded discovery of more than one per month, for a grand total of about 176 to date. So far, most known extrasolar planets have been Jupiter-sized or larger, with the detection of Earth-sized planets beyond our current technology. But the Impact of Computing is finding its way here as well, and new instruments will continue to deliver an exponentially growing ability to detect smaller and more distant planets. Mere projection of the rate of discovery since 1995 predicts that thousands of planets, some of them Earth-sized, will be discovered by 2015. To comfortably expect this, we just need to examine whether advances in astronomical observation are keeping up with this trend. Let's take a detailed look at the chart below from a Jet Propulsion Laboratory publication, which has a lot of information. The bottom horizontal axis is the distance from the star, and the top horizontal axis is the orbital period (the top and bottom can contradict each other for stars of different mass, but let's put that aside for now). The right vertical axis is the mass as a multiple of the Earth's mass. The left vertical axis is the same thing, merely in Jupiter masses (318 times that of the Earth). 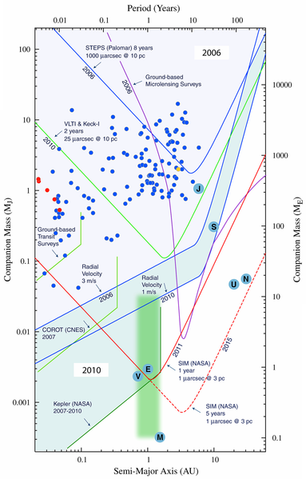 Current detection capability represents the area above the purple and first two blue lines, and the blue, red, and yellow dots represent known extrasolar planets. Planets less massive than Saturn have been detected only when they are very close to their stars. The green band represents the zone on the chart where an Earth-like planet, with similar mass and distance from its star as our Earth, would reside. Such a planet would be a candidate for life. The Kepler Space Observatory will launch in mid-2008, and by 2010-11 will be able to detect planets in the green zone around stars as far as 1000 light years away. It is set to examine 100,000 different stars, so it would be very surprising if the KSO didn't find dozens of planets in the green-zone. After 2015, instruments up to 1000 times more advanced than those today, such as the Overwhelmingly Large Telescope and others, will enable us to conduct more detailed observations of the hundreds of green-zone planets that will be identified by then. We will begin to get an idea of their color (and thus the presence of oceans) and atmospheric composition. From there, we will have a distinct list of candidate planets that could support Earth-like life. This will be a fun one to watch over the next decade. Wait for the first headline of 'Earth-like planet discovered' in 2010 or 2011. Yes, that is true. You seem more optimistic now than before.. It is exciting to see astronomical observation technology begin to get slightly pegged to Moore's Law. A torrent of fascinating discoveries await us over the next several years. This is actually very interesting - what is the difference between transit surveys and microlensing surveys? Transit is when the planet passes in front of the star, and is detected by observing a temporary dimness in the star. Obviously, only planets that are very large and very close to the star can be found this way (the red dots). Microlensing is when the background of space seen between the star and planet is temporarily magnified. When this magnification is noticed, it means there are two objects on either side, and since one is the star that is seen, the other must be a planet. This is inefficient, as only that one yellow dot has been found this way. Neither method will find planets in the green zone. The KSO will do that. I believe I heard news on this recently. I'm not sure if they've found observable evidence since I have no link to the article, but it's already come to my attention outside of this article that their is high likelihood of their being earth-like planets in other solar systems. The world pre-empted your prediction, GK. The merit of your articles has just been put into question. What say you to that? This article was written in March of 2006. The findings after that thus confirm my predictions as correct. Take note of the timeline of events.